Once you're done scanning some photos with the Photo Scanner app by Photomyne, you're welcome to save (export) them outside of the app, on your device and elsewhere. Watch the movie tutorial showing how to save the photos you scanned with the Photomyne app. By default, the photos you scan with Photomyne's photo scanner app are saved within the app. If you would like to save them to your device as well, please follow these simple steps. The following tutorial applies to both the iOS and Android Photomyne apps. 1. Go to the album you would like to save to your device. Tap the download (down-facing arrow) icon, the second from the left, under the album's title. 2. Then tap to select the photos you'd like to save. If you want to save all the photos of that album, simply tap the circle on the top-right to instantly select all the photos with one tap. Tap the download icon to open the photo selection screen. Choose the way you wish to save your photos: in good quality, in the best quality (premium account option), or save photos to your PC or Mac in the best quality (premium account option). If you wish to save the photos to your PC, simply add your email and Photomyne will email you a download link you can open on your PC or Mac (zip folder download). 4. Photos saved! All done. 5. If you've chosen to save photos to your device, they will be saved to your device's default photos gallery app. 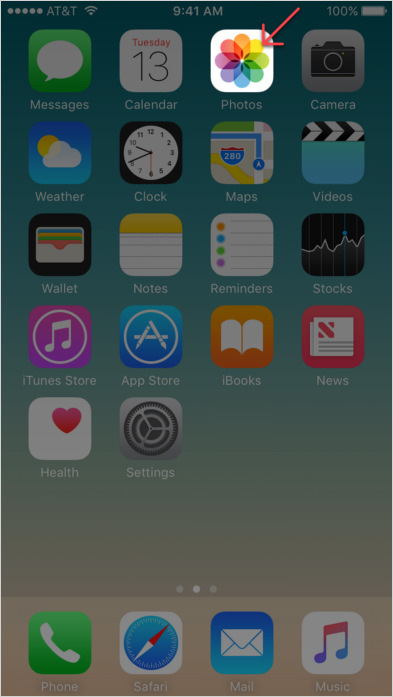 On iPhones and iPads, access the photos you just saved using the Photos app. A note on saving photos to your Android device: If your Android device has an SD card, the photo files of your album will be saved to the card. If you don't have an SD card, then photos will be saved locally on the device and will take up storage space accordingly. 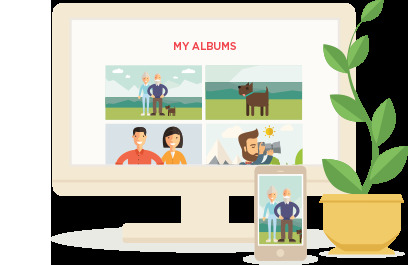 If using the free app, you're welcome to subscribe to a Photomyne Account - this includes the full app's utility features, plus unlimited photo backup, web access to view your photos on any device or PC, and freeing up space on your device (cloud-only backup). The action of saving scanned photos to your device keeps the same photo order as it was on the app. 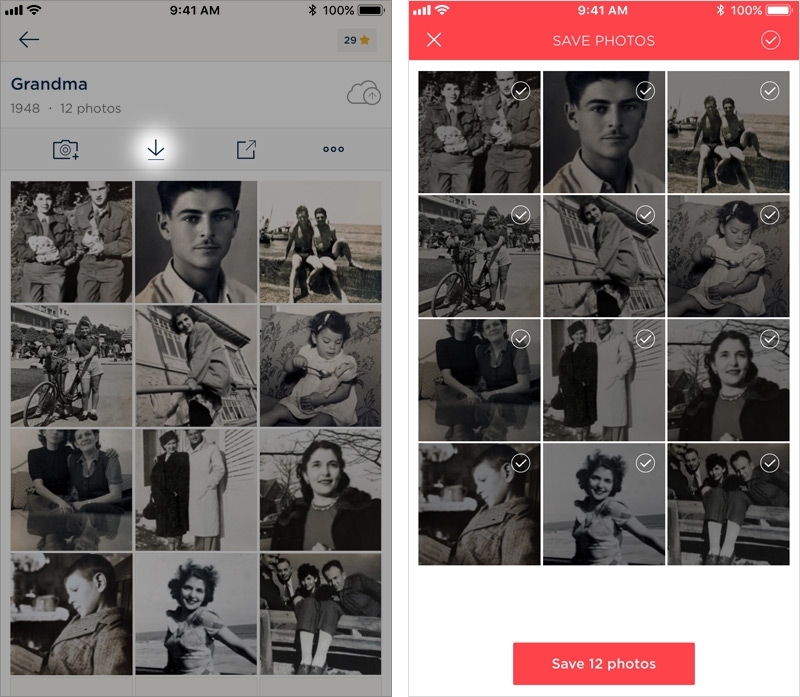 In most mobile devices, the photo gallery/camera roll will organize your new saved photos based on the year you assigned to the album in the Photomyne app. In iOS devices: For your convenience, there's also a Photomyne photos album in your iOS photos app. 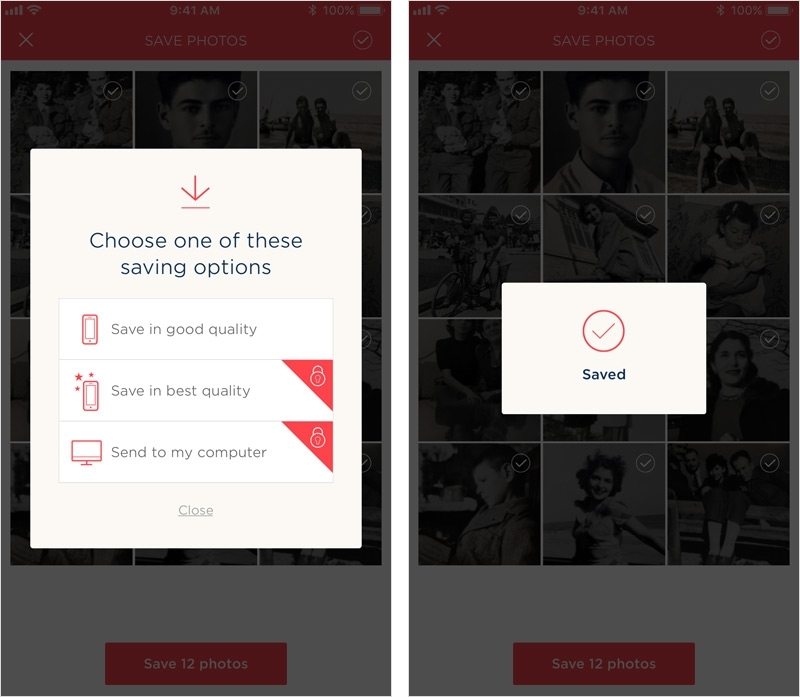 All your saved scanned photos with the app will also appear there. If you have an android device, the scanned Photomyne photos will appear in your photos' default folder, as you defined on your device.